Curcumin, the substance that imparts a golden color to the spice turmeric, plays a starring role in several global cuisines. It's also known for its therapeutic properties. Curcumin-containing turmeric is used to treat a variety of diseases and conditions, including those of the skin, pulmonary and gastrointestinal systems, according to an article in "Advances in Experimental Medicine and Biology" published in 2007. 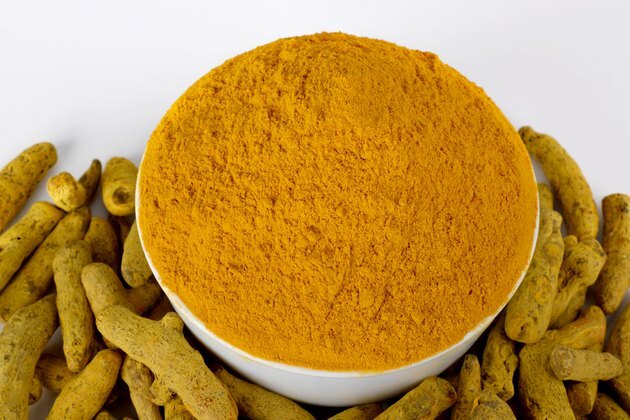 Adding curcumin-containing foods to your diet can give your health a powerful boost. One of the most traditional and versatile of spices used in Indian cooking is turmeric, according to Monisha Bharadwaj, author of "The Indian Spice Kitchen: Essential Ingredients and Over 200 Authentic Recipes." Bharadwaj notes that this curcumin-containing spice is the heart and soul of any curry, and it enhances and balances the flavors of all other ingredients. It's included in a range of dishes, including those featuring lentils, meats and vegetables. Indonesia's love of turmeric developed when missionaries and merchants who were traveling ancient trade routes first brought the spice to the islands from India, according to Kari Cornell and Merry Anwar, authors of "Cooking the Indonesian Way." Turmeric is used in vegetable, fish or meat side dishes, red and yellow curries and yellow rice -- rice flavored with turmeric -- which is a favorite dish. Many Thai foods contain curcumin because of the ingredient turmeric. According to Hugh T.W. Tan, author of "Herbs & Spices of Thailand," turmeric is commonly used in southern Thai cooking. Tan notes that turmeric is used in Thai curry pastes, especially yellow curry paste; in fish dishes, soups and sauces; and even with grilled fruit such bananas and coconut. Many foods in Western countries contain curcumin-containing turmeric. Because it imparts a bright yellow or golden hue to foods, turmeric is often added to mustard, condiments and sauces, according to Susheela Raghavan, author of "Handbook of Spices, Seasonings and Flavorings." Turmeric is also a common ingredient in deviled eggs, Worcestershire sauce, chicken stock, potatoes, cheeses, yogurt, sausages, egg salads, pickles, relishes, spreads and beverages. What Foods Have the Herb Ginger in Them?